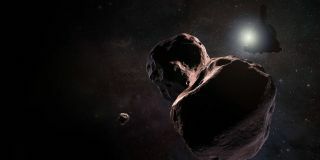 An artist's illustration of NASA's New Horizons spacecraft cruising by the distant object Ultima Thule on Jan. 1, 2019. NASA's New Horizons spacecraft will indeed get very close to the mysterious, distant object Ultima Thule on New Year's Day. Mission principal investigator Alan Stern today (Dec. 18) gave the all-clear for New Horizons to stay on its optimal flyby course, which will take the probe within just 2,200 miles (3,500 kilometers) of Ultima Thule at 12:33 a.m. EST (0533 GMT) on Jan. 1. "Our team feels like we have been riding along with the spacecraft, as if we were mariners perched on the crow's nest of a ship, looking out for dangers ahead," hazards team leader Mark Showalter, of the SETI (Search for Extraterrestrial Intelligence) Institute in Mountain View, California, said in a statement. "The team was in complete consensus that the spacecraft should remain on the closer trajectory, and mission leadership adopted our recommendation." This image was made by combining hundreds of photos taken between August and mid-December by New Horizons' Long Range Reconnaissance Imager. It has been colored using deep blue for the darkest regions and yellow for the brightest. Ultima Thule is the bright-yellow spot in the middle, and New Horizons' two possible flyby distances are indicated by the two concentric circles. The mission has decided to fly along the closer path, toward the target point marked by an X. Individual images contain many background stars, but by combining images taken at different distances from Ultima Thule, most of the stars can be identified and removed. However, some of them leave behind traces, which can be seen as faint circles radiating away from the target point. The recent hazard hunt was capable of detecting any moons at least 2 miles (3.2 km) wide, and any ring structure that reflects at least 0.00005 percent of the sunlight falling on it, mission team members said. The Ultima Thule flyby is the centerpiece of New Horizons' extended mission. The probe's prime mission focused on the first-ever flyby of Pluto, which New Horizons pulled off in July 2015, zooming within 7,800 miles (12,550 km) of the dwarf planet. "The spacecraft is now targeted for the optimal flyby, over three times closer than we flew to Pluto," Stern, who's based at the Southwest Research Institute in Boulder, Colorado, said in the same statement. "Ultima, here we come!" Ultima Thule, which is officially known as 2014 MU69, lies about 1 billion miles (1.6 billion km) beyond Pluto. So, the New Year's flyby will be the most-distant planetary encounter in the history of spaceflight. And it should reveal key insights about the solar system's early days, because Ultima is a pristine, deep-frozen relic left over from the planet-formation period, mission team members have said. It's a mysterious relic as well. Ultima appears to be reddish in color and about 23 miles (37 km) wide, but that's about all astronomers know about the object. Indeed, they aren't even sure if Ultima is a single body or a close-orbiting pair. We'll know a lot more after the flyby, of course. And, if you want to send New Horizons some words of encouragement on encounter day, there's still time. You can arrange to beam a greeting to the far-flung probe through Friday (Dec. 21). Go to http://pluto.jhuapl.edu/Send-Greetings/ to learn more.